US President Hussein Obama doesn't want to go off into the sunset in January 2017. He wants to become Secretary General of the United Nations. And Israeli Prime Minister Binyamin Netanyahu is determined to stop him (Hat Tip: Fox Nation). Actually, the problem isn't that he ignored us - the problem is that he is obsessed with us. And you were wondering how Netanyahu really feels about Obama? 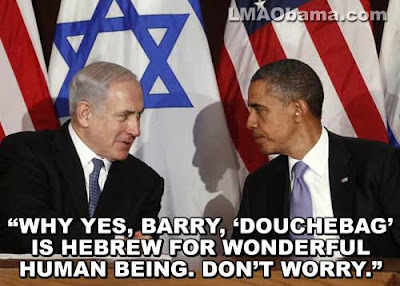 Does this mean that we can expect an Israeli attack on Iran once Obama is out of office? Hmmm. U.N. Secretary General Ban Ki-moon's term expires in early 2017, making Obama’s bid for the position a possibility. Last year after his speech at West Point, some pointed out that he sounded an awful lot like he was campaigning for the role. Well at least it will finally be when he reveals he's Muslim. He belongs there with his Muslim brothers and he has set the U.S. up for the same invasion by illegals that Europe is dealing with. He has "Changed" the world just as he promised.